Whatever your personal style, warm and rustic or sleek and refined, our premier vertical window blinds will inspire you and dress your windows beautifully. Standard dust cover valance for added elegance is included at no charge to you. Easy to clean and maintain our premier window vertical blinds will give you the look of a fabric but with the durability of PVC. Our Premier Vertical Blinds come with a self adjusting all metal headrail our vertical window blinds are simply the top of the line product that our customers have come to expect. With quality and durability built in to last for years. 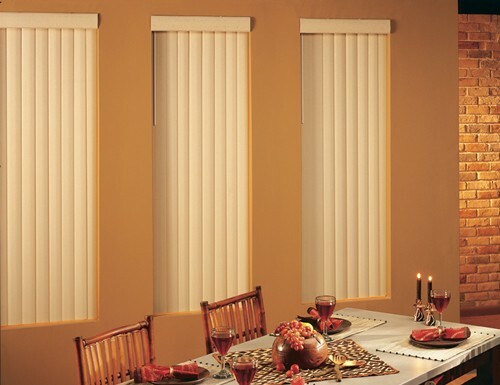 Our elegant premier line of custom vertical blinds will be the perfect fit for your windows! and installation was super easy. and installation was super easy. I’m pleased with its appearance and will add additional Blinds in the future. A handyman installed easily them within minutes. Great blinds - easy to install and good quality. These blinds were everything I expected. These blinds were everything I expected. They are beautiful, easy to install, easy to clean, and really dressed up my room.Great service and great price.